Florida scrub-jay | Florida Hikes! 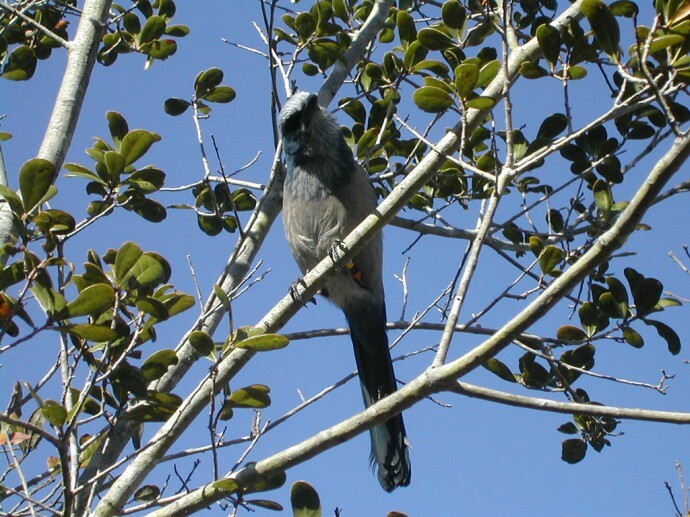 Seen in very specific scrub habitats with smaller trees, the Florida scrub-jay is only found in Florida, its population in decline and severely limited by lack of habitat. It is a friendly and curious bird, and when feeling no threat, almost tame. They are unexpectedly large, eight inches tall, and so bright and colorful they’re unmistakable when one swoops down to land on a snag in front of you, or, in the case of Lyonia Preserve, on your head. Preferring young scrub forests – which regenerate naturally when fire sweeps through the scrub, something that has been actively suppressed throughout Florida – they don’t migrate far. Each pair mates for life, raising its family with the aid of helpers, children of the pair with no mating attachment, who delay their own breeding to help raise a family. Families travel together across a territorial spread of 25 acres. Families tend to appear together, and when they do, it’s like having a flock of parrots surrounding you. Boldly, they hop to the ground, poke around at sticks, and whir past in a blur, landing on your head! But when the family’s sentinel – on the lookout for danger – gives a sharp shrweep, the birds melt back into the scrub, shuffling across the forest floor in search of acorns, insects, and lizards. During the acorn season, each family will gather a cache of acorns, as squirrels do, to feed themselves during the leaner times. I have seen these birds for several years at a location near the south side of Lake Kerr near Salt Springs. I didn’t know what they were until I looked online. They are definitely into the scrubby oaks in the Ocala National Forest. I live in SW Ocala,FL and have scrubjays here. Nice! Are you near the Withlacoochee River? We’ve seen them at Halpata Tastanaki Preserve not far in off SR 200.